As a worldwide accepted standard, the transfer protocol IEC 61850 from the International Electrotechnical Commission (IEC) provides generally applicable provisions for communication between devices in medium voltage and high voltage electrical switching equipment and also defines the system requirements necessary for it. 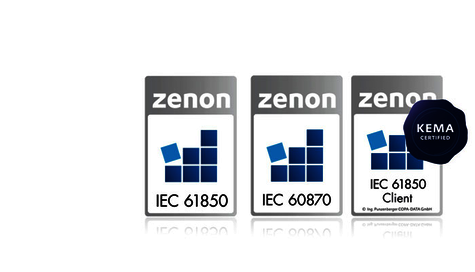 Whereas under IEC 60870, the selection of the command mode in zenon is configured by means of parameters, this is carried out in IEC 61850 by means of the control model of the logical node and then at protocol level. Also, the command and response variables are defined differently. Under IEC 60870, they are defined by selecting the type ID (numerically); with IEC 61850 the addressing is displayed in an object model (symbolically). Maximum performance is of crucial importance for the communication between each of the bay units. This is where the IEC 61850 feature, the GOOSE protocol comes into use. GOOSE is based on UDP (User Datagram Protocol), is very fast and communicates in the Publisher-Subscriber (Multicast) mode. straton can communicate as independent Soft-SPS or as integrated SCADA Logic in zenon via the GOOSE protocol. And this is regardless of whether it is active as an IEC 61850 server. For communication, supervisory and control of wind power plants COPA-DATA provides an IEC 61400-25 driver. The mapping complies with Part 4, Appendix C (MMS) of the standard. The driver represents the client-side and can be configured via SCL data import.